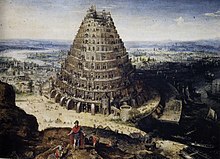 The Tower of Babel (Hebrew: מִגְדַּל בָּבֶל‎, Migdal Bavel) as told in Genesis 11:1–9 is an origin myth meant to explain why the world's peoples speak different languages. According to the story, a united humanity in the generations following the Great Flood, speaking a single language and migrating eastward, comes to the land of Shinar (שִׁנְעָר). There they agree to build a city and a tower tall enough to reach heaven. God, observing their city and tower, confounds their speech so that they can no longer understand each other, and scatters them around the world. Some modern scholars have associated the Tower of Babel with known structures, notably the Etemenanki, a ziggurat dedicated to the Mesopotamian god Marduk in Babylon. A Sumerian story with some similar elements is told in Enmerkar and the Lord of Aratta. The phrase "Tower of Babel" does not appear in the Bible; it is always "the city and the tower" (אֶת-הָעִיר וְאֶת-הַמִּגְדָּל) or just "the city" (הָעִיר). The original derivation of the name Babel (also the Hebrew name for Babylon) is uncertain. The native, Akkadian name of the city was Bāb-ilim, meaning "gate of God". However, that form and interpretation itself are now usually thought to be the result of an Akkadian folk etymology applied to an earlier form of the name, Babilla, of unknown meaning and probably non-Semitic origin. According to the Bible, the city received the name "Babel" from the Hebrew verb בָּלַ֥ל (bālal), meaning to jumble or to confuse. The narrative of the tower of Babel (Genesis 11.1–9) is an etiology or explanation of a phenomenon. Etiologies are narratives that explain the origin of a custom, ritual, geographical feature, name, or other phenomenon. :426 The story of the Tower of Babel explains the origins of the multiplicity of languages. God was concerned that humans had blasphemed by building the tower to avoid a second flood so God brought into existence multiple languages. :51 Thus, humans were divided into linguistic groups, unable to understand one another. There is a Sumerian myth similar to that of the Tower of Babel, called Enmerkar and the Lord of Aratta, where Enmerkar of Uruk is building a massive ziggurat in Eridu and demands a tribute of precious materials from Aratta for its construction, at one point reciting an incantation imploring the god Enki to restore (or in Kramer's translation, to disrupt) the linguistic unity of the inhabited regions—named as Shubur, Hamazi, Sumer, Uri-ki (Akkad), and the Martu land, "the whole universe, the well-guarded people—may they all address Enlil together in a single language." In addition, a further Assyrian myth, dating from the 8th century BC during the Neo-Assyrian Empire (911–605 BC) bears a number of similarities to the later written Biblical story. Various traditions similar to that of the tower of Babel are found in Central America. Some writers[who?] connected the Great Pyramid of Cholula to the Tower of Babel. The Dominican friar Diego Durán (1537–1588) reported hearing an account about the pyramid from a hundred-year-old priest at Cholula, shortly after the conquest of Mexico. He wrote that he was told when the light of the sun first appeared upon the land, giants appeared and set off in search of the sun. Not finding it, they built a tower to reach the sky. An angered Lord of the Heavens called upon the inhabitants of the sky, who destroyed the tower and scattered its inhabitants. The story was not related to either a flood or the confusion of languages, although Frazer connects its construction and the scattering of the giants with the Tower of Babel. Still another story, attributed to the Tohono O'odham people, holds that Montezuma escaped a great flood, then became wicked and attempted to build a house reaching to heaven, but the Great Spirit destroyed it with thunderbolts. Traces of a somewhat similar story have also been reported among the Tharu of Nepal and northern India. According to David Livingstone, the Africans whom he met living near Lake Ngami in 1849 had such a tradition, but with the builders' heads getting "cracked by the fall of the scaffolding". 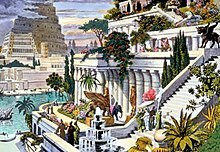 Hanging Gardens of Babylon (19th century illustration), depicts the Tower of Babel in the background. Biblical scholars see the Book of Genesis as mythological and not as a historical account of events. Nonetheless, the story of Babel can be interpreted in terms of its context. Reconstruction of the Etemenanki, which was 91 metres (300 ft) in height. Isaac Asimov speculated that the authors of Genesis 11:1–9 were inspired by the existence of an apparently incomplete ziggurat at Babylon, and by the phonological similarity between Babylonian Bab-ilu, meaning "gate of God", and the Hebrew word balal, meaning "mixed", "confused", or "confounded". Now it was Nimrod who excited them to such an affront and contempt of God. He was the grandson of Ham, the son of Noah, a bold man, and of great strength of hand. He persuaded them not to ascribe it to God as if it were through his means they were happy, but to believe that it was their own courage which procured that happiness. He also gradually changed the government into tyranny, seeing no other way of turning men from the fear of God, but to bring them into a constant dependence on his power... Now the multitude were very ready to follow the determination of Nimrod and to esteem it a piece of cowardice to submit to God; and they built a tower, neither sparing any pains, nor being in any degree negligent about the work: and, by reason of the multitude of hands employed in it, it grew very high, sooner than any one could expect; but the thickness of it was so great, and it was so strongly built, that thereby its great height seemed, upon the view, to be less than it really was. It was built of burnt brick, cemented together with mortar, made of bitumen, that it might not be liable to admit water. When God saw that they acted so madly, he did not resolve to destroy them utterly, since they were not grown wiser by the destruction of the former sinners [in the Flood]; but he caused a tumult among them, by producing in them diverse languages, and causing that, through the multitude of those languages, they should not be able to understand one another. The place wherein they built the tower is now called Babylon, because of the confusion of that language which they readily understood before; for the Hebrews mean by the word Babel, confusion. The Sibyl also makes mention of this tower, and of the confusion of the language, when she says thus:--"When all men were of one language, some of them built a high tower, as if they would thereby ascend up to heaven; but the gods sent storms of wind and overthrew the tower, and gave everyone a peculiar language; and for this reason it was that the city was called Babylon." Another story in Sura 2:102 mentions the name of Babil, but tells of when the two angels Harut and Marut taught magic to some people in Babylon and warned them that magic is a sin and that their teaching them magic is a test of faith. A tale about Babil appears more fully in the writings of Yaqut (i, 448 f.) and the Lisān al-ʿArab [ar] (xiii. 72), but without the tower: mankind were swept together by winds into the plain that was afterward called "Babil", where they were assigned their separate languages by God, and were then scattered again in the same way. In the History of the Prophets and Kings by the 9th-century Muslim theologian al-Tabari, a fuller version is given: Nimrod has the tower built in Babil, God destroys it, and the language of mankind, formerly Syriac, is then confused into 72 languages. Another Muslim historian of the 13th century, Abu al-Fida relates the same story, adding that the patriarch Eber (an ancestor of Abraham) was allowed to keep the original tongue, Hebrew in this case, because he would not partake in the building. The Church of Jesus Christ of Latter-day Saints teaches that the Tower of Babel story is historical fact. "Although there are many in our day who consider the accounts of the Flood and tower of Babel to be fiction, Latter-day Saints affirm their reality." This article is about the origin myth. For the film, see The Confusion of Tongues. The Confusion of Tongues by Gustave Doré, a woodcut depicting the Tower of Babel. The confusion of tongues (confusio linguarum) is the origin myth for the fragmentation of human languages described in the Book of Genesis 11:1–9, as a result of the construction of the Tower of Babel. Before the acceptance of the Indo-European language family, these languages were considered to be "Japhetite" by some authors (e.g., Rasmus Rask in 1815; see Indo-European studies). Beginning in Renaissance Europe, priority over Hebrew was claimed for the alleged Japhetic languages, which were supposedly never corrupted because their speakers had not participated in the construction of the Tower of Babel. Among the candidates for a living descendant of the Adamic language were: Gaelic (see Auraicept na n-Éces); Tuscan (Giovanni Battista Gelli, 1542, Piero Francesco Giambullari, 1564); Dutch (Goropius Becanus, 1569, Abraham Mylius, 1612); Swedish (Olaus Rudbeck, 1675); German (Georg Philipp Harsdörffer, 1641, Schottel, 1641). The Swedish physician Andreas Kempe wrote a satirical tract in 1688, where he made fun of the contest between the European nationalists to claim their native tongue as the Adamic language. Caricaturing the attempts by the Swede Olaus Rudbeck to pronounce Swedish the original language of mankind, Kempe wrote a scathing parody where Adam spoke Danish, God spoke Swedish, and the serpent French. The primacy of Hebrew was still defended by some authors until the emergence of modern linguistics in the second half of the 18th century, e.g. by Pierre Besnier [fr] (1648–1705) in A philosophicall essay for the reunion of the languages, or, the art of knowing all by the mastery of one (1675) and by Gottfried Hensel (1687–1767) in his Synopsis Universae Philologiae (1741). 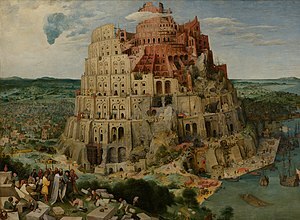 The literal belief that the world's linguistic variety originated with the tower of Babel is pseudolinguistics, and is contrary to the known facts about the origin and history of languages. There are several mediaeval historiographic accounts that attempt to make an enumeration of the languages scattered at the Tower of Babel. Because a count of all the descendants of Noah listed by name in chapter 10 of Genesis (LXX) provides 15 names for Japheth's descendants, 30 for Ham's, and 27 for Shem's, these figures became established as the 72 languages resulting from the confusion at Babel—although the exact listing of these languages changed over time. (The LXX Bible has two additional names, Elisa and Cainan, not found in the Masoretic text of this chapter, so early rabbinic traditions, such as the Mishna, speak instead of "70 languages".) Some of the earliest sources for 72 (sometimes 73) languages are the 2nd-century Christian writers Clement of Alexandria (Stromata I, 21) and Hippolytus of Rome (On the Psalms 9); it is repeated in the Syriac book Cave of Treasures (c. 350 CE), Epiphanius of Salamis' Panarion (c. 375) and St. Augustine's The City of God 16.6 (c. 410). The chronicles attributed to Hippolytus (c. 234) contain one of the first attempts to list each of the 72 peoples who were believed to have spoken these languages. The Book of Genesis does not mention how tall the tower was. The phrase used to describe the tower, “its top in the sky” (v.4), was an idiom for impressive height; rather than implying arrogance this was simply a cliché for height. :37 The tower's height is discussed in various extra-canonical sources. Gregory of Tours writing c. 594, quotes the earlier historian Orosius (c. 417) as saying the tower was "laid out foursquare on a very level plain. Its wall, made of baked brick cemented with pitch, is fifty cubits wide, two hundred high, and four hundred and seventy stades in circumference. A stade contains five agripennes. Twenty-five gates are situated on each side, which make in all one hundred. The doors of these gates, which are of wonderful size, are cast in bronze. The same historian tells many other tales of this city, and says: 'Although such was the glory of its building still it was conquered and destroyed.'" In his book, Structures: Or Why Things Don't Fall Down (Pelican 1978–1984), Professor J.E. Gordon considers the height of the Tower of Babel. He wrote, 'brick and stone weigh about 120 lb per cubic foot (2,000 kg per cubic metre) and the crushing strength of these materials is generally rather better than 6,000 lbf per square inch or 40 megapascals. Elementary arithmetic shows that a tower with parallel walls could have been built to a height of 2.1 km (1.3 mi) before the bricks at the bottom were crushed. However, by making the walls taper towards the top they ... could well have been built to a height where the men of Shinnar would run short of oxygen and had difficulty in breathing before the brick walls crushed beneath their own dead weight." Pieter Brueghel's influential portrayal is based on the Colosseum in Rome, while later conical depictions of the tower (as depicted in Doré's illustration) resemble much later Muslim towers observed by 19th-century explorers in the area, notably the Minaret of Samarra. M.C. Escher depicts a more stylized geometrical structure in his woodcut representing the story. The composer Anton Rubinstein wrote an opera based on the story Der Thurm zu Babel. Fritz Lang's 1927 film Metropolis, in a flashback, plays upon themes of lack of communication between the designers of the tower and the workers who are constructing it. The short scene states how the words used to glorify the tower's construction by its designers took on totally different, oppressive meanings to the workers. This led to its destruction as they rose up against the designers because of the insufferable working conditions. The appearance of the tower was modeled after Brueghel's 1563 painting. The political philosopher Michael Oakeshott surveyed historic variations of the Tower of Babel in different cultures and produced a modern retelling of his own in his 1983 book, On History. In his retelling, Oakeshott expresses disdain for human willingness to sacrifice individuality, culture, and quality of life for grand collective projects. He attributes this behaviour to fascination with novelty, persistent dissatisfaction, greed, and lack of self-reflection. A.S. Byatt's novel Babel Tower (1996) is about the question "whether language can be shared, or, if that turns out to be illusory, how individuals, in talking to each other, fail to understand each other". The progressive band Soul Secret wrote a concept album called BABEL, based on a modernized version of the myth. Science fiction writer Ted Chiang wrote a story called "Tower of Babylon" that imagined a miner's climbing the tower all the way to the top where he meets the vault of heaven. Fantasy novelist Josiah Bancroft has a series The Books Of Babel, which is to conclude with book IV in 2020. ^ Metzger, Bruce Manning; Coogan, Michael D (2004). The Oxford Guide To People And Places Of The Bible. Oxford University Press. p. 28. ISBN 978-0-19-517610-0. Retrieved 22 December 2012. ^ a b Levenson, Jon D. (2004). "Genesis: Introduction and Annotations". In Berlin, Adele; Brettler, Marc Zvi (eds.). The Jewish Study Bible. Oxford University Press. p. 29. ISBN 9780195297515. ^ Graves, Robert; Patai, Raphael (1986). Hebrew Myths: The Book of Genesis. Random House. p. 315. ISBN 9780795337154. ^ Schwartz, Howard; Loebel-Fried, Caren; Ginsburg, Elliot K. (2007). Tree of Souls: The Mythology of Judaism. Oxford University Press. p. 704. ISBN 9780195358704. ^ a b Kramer, Samuel Noah (1968). "The 'Babel of Tongues': A Sumerian Version". Journal of the American Oriental Society. 88 (1). pp. 108–111. ^ Day, John (2014). From Creation to Babel: Studies in Genesis 1-11. Bloomsbury Publishing. pp. 179–180. ISBN 978-0-567-37030-3. ^ John L. Mckenzie (1995). The Dictionary Of The Bible. Simon and Schuster. p. 73. ISBN 978-0-684-81913-6. ^ a b c Coogan, Michael D. (2009). A Brief Introduction to the Old Testament: the Hebrew Bible in its Context. Oxford University Press. ISBN 9780195332728. ^ a b Harris, Stephen L. (1985). Understanding the Bible: A Reader's Introduction. Palo Alto: Mayfield. ISBN 9780874846966. ^ a b Hiebert, Theodore (2007). "The Tower of Babel and the Origin of the World's Cultures". Journal of Biblical Literature. 126 (1): 29–58. doi:10.2307/27638419. JSTOR 27638419. ^ Blenkinsopp, Joseph (1995). "Introduction to the Pentateuch". In Keck, Leander E. (ed.). The New Interpreter's Bible. Nashville: Abingdon Press. p. 310. ISBN 9780687278145. ^ "Enmerkar and the lord of Aratta: composite text." Electronic Text Corpus of Sumerian Literature. Line 145f. : an-ki ningin2-na ung3 sang sig10-ga den-lil2-ra eme 1-am3 he2-en-na-da-ab-dug4. ^ "Gateway to the Heavens: The Assyrian Account to the Tower of Babel". Ancient Origins. Retrieved 11 September 2017. ^ a b Frazer, James George (1919). Folk-lore in the Old Testament: Studies in Comparative Religion, Legend and Law. London: Macmillan. pp. 362–387. ^ "Fernando de Alva Ixtlilxóchitl". letras-uruguay.espaciolatino.com. Retrieved 24 October 2018. ^ Bancroft, vol. 3, p. 76. ^ Farish, Thomas Edwin (1918). History of Arizona, Volume VII. Phoenix. pp. 309–310. Retrieved 5 March 2014. ^ Beverley, H. (1872). Report On The Census Of Bengal. Calcutta: Bengal Secretariat Press. p. 160. ^ David Livingstone (1858). Missionary Travels and Researches In South Africa. Harper & Brothers. p. 567. ^ Levenson 2004, p. 11 "How much history lies behind the story of Genesis? Because the action of the primeval story is not represented as taking place on the plane of ordinary human history and has so many affinities with ancient mythology, it is very far-fetched to speak of its narratives as historical at all." ^ a b c Jastrow, Morris; Price, Ira Maurice; Jastrow, Marcus; Ginzberg, Louis; MacDonald, Duncan B. (1906). "Babel, Tower of". Jewish Encyclopedia. New York: Funk & Wagnalls. pp. 395–398. ^ Harris, Stephen L. (2002). Understanding the Bible. McGraw-Hill. pp. 50–51. ISBN 9780767429160. ^ Jeffrey, Grant R. (2013). Unveiling Mysteries of the Bible. Colorado Springs: WaterBrook Press. pp. 33–39. ISBN 9780307508607. ^ Lorenzi, Rossella (27 December 2011). "Ancient Texts Part of Earliest Known Documents". Discovery Channel News. Archived from the original on 21 August 2015. ^ "The Tower of Babel Stele". Schoyen Collection. Retrieved 28 December 2011. ^ Asimov, Isaac (1971). Asimov's Guide to the Bible, vol.1: The Old Testament. Avon Books. pp. 54–55. ISBN 9780380010325. ^ The Biblical Antiquities of Philo. Translated by James, M. R. London: SPCK. 1917. pp. 90–94. ^ Ginzberg, Louis (1909). Legends of the Jews, Volume 1. New York. Archived from the original on 1 October 2015. ^ "Surat Al-Baqarah [2:102] – The Noble Qur'an – القرآن الكريم". Quran.com. Retrieved 7 November 2013. ^ Emerick, Yahiya (2002). The Complete Idiot's Guide to Understanding Islam. Indianapolis: Alpha. p. 108. ISBN 9780028642338. ^ Moevs, Christian (21 March 2014). "Dante and Adam in Paradiso of the Divine Comedy The Eucharist and self-knowledge". News.VA. Retrieved 24 October 2014. ^ Olender, Maurice (1992). The Languages of Paradise: Race, Religion, and Philology in the Nineteenth Century. Trans. Arthur Goldhammer. Cambridge, Massachusetts and London: Harvard University Press. ISBN 0-674-51052-6. ^ Pennock, Robert T. (2000). Tower of Babel: The Evidence against the New Creationism. Bradford Books. ISBN 9780262661652. ^ Frazer, James George (1919). Folk-lore in the Old Testament: Studies in Comparative Religion, Legend and Law. London: Macmillan. p. 384. ^ Gregory of Tours, History of the Franks, from the 1916 translation by Earnest Brehaut, Book I, chapter 6. Available online in abridged form. ^ Selections from Giovanni's Chronicle in English. ^ Bukatman, Scott (1997). Blade Runner. London: British Film Institute. pp. 62–63. ISBN 0-85170-623-1. ^ Worthington, G. (2016). Religious and Poetic Experience in the Thought of Michael Oakeshott. British Idealist Studies 1: Oakeshott. Andrews UK Limited. p. 121f. ISBN 978-1-84540-594-6. ^ Reprinted as Oakeshott, Michael (1989). "The tower of Babel". In Clarke, S.G.; Simpson, E. (eds.). Anti-Theory in Ethics and Moral Conservatism. SUNY Series in Ethical Theory. State University of New York Press. p. 185ff. ISBN 978-0-88706-912-3. Retrieved 25 May 2018. ^ Corey, E. C. (2006). Michael Oakeshott on Religion, Aesthetics, and Politics. Eric Voegelin Institute series in political philosophy. University of Missouri Press. p. 129–131. ISBN 978-0-8262-6517-3. ^ Dorschel, Andreas (25 November 2004). "Ach, Sie waren nicht in Oxford? Antonia S. Byatts Roman "Der Turm zu Babel"". Süddeutsche Zeitung 274 (in German). p. 16. Chisholm, Hugh, ed. (1911). "Babel" . Encyclopædia Britannica. 3 (11th ed.). Cambridge University Press. p. 91. Pr. Diego Duran, Historia Antiqua de la Nueva Espana (Madrid, 1585) . Klaus Seybold, "Der Turmbau zu Babel: Zur Entstehung von Genesis XI 1–9," Vetus Testamentum (1976). Kyle Dugdale: Babel's Present. Ed. by Reto Geiser and Tilo Richter, Standpunkte, Basel 2016, ISBN 978-3-9523540-8-7 (Standpunkte Dokumente No. 5).